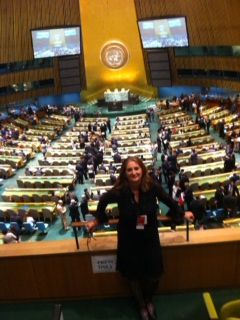 Today, April 2, 2013, history was made at the United Nations General Assembly. Building on a process that began with a formal letter from Oscar Arias to the United Nations, a multiple-decade process has culminated in a vote to adopt the first global arms trade treaty including all of mankind. 154 countries voted: Yes. 3 countries voted: No (Iran, North Korea & Syria -- the same countries that blocked the treaty last Thursday on the final day of the ATT at the UN). 23 countries abstained, including China and Russia. Two years ago, a Russian diplomat raised the question: "Do you mean that after the arms trade treaty is signed that nations will be able to create laws that they can manage nationally for the import and export of legal weapons? They don't need a treaty to do that. They can do that now." Every country has come to the United Nations to implement an arms trade treaty. The process has taken years and a great deal of money. Watching this process, I have witnessed disagreements bring information forward, absorbed and sometimes answered -- as if one brain functions from exponential thoughts. Agreeing / not agreeing takes a lower priority to the potential of creating a robust lawfully binding treaty that is a new floor to build upon. An initial treaty with that includes and addresses gender based violence, illicit weapons trafficking, strong provisions on diversion of weapons and the beginning of addressing the requirements of structures to implement organizing weapons use. Could these elements begin a world of responsibility addressing violence on earth on a global level? Bravo to the world stage, on this effort of the many to act as one. It is my honor to have been here and my birthday as well. On this day human beings have come together in a great compromise. One big step toward a world at peace? I can surely go into the turmoil, arguments, levels of disagreements and disappointments. Rare are the moments of positive pause amongst a world of lawyers who have hand created with each government in the world involved -- the first arms trade treaty created by the human race. So, to answer the Russian diplomat's question: Perhaps the countries could have created export contracts prior to this agreement. For sure it hasn't solved as much as it could or should. But momentum has begun and the steps toward a world at peace is as individualistic as each person, as complicated as each country and as impossible as our ability to hear the truth of another. I say out of this, there are as many next steps as grains of sand and stars in the sky. Get the idea? Nothing takes the place of the moral center of the human being. Nothing. No steel of any kind picks itself up. The world has a new floor on arms trade. It will not be walked upon lightly. This treaty will not stop illicit weapons trade. It will support the efforts of many, many people who will put their lives on the line to accomplish this -- the unknown heroes in the subtle corners who do the work. These documents will support their efforts but will not take the place of one of them. Again, I am increasingly impressed with the United States delegation. I watch from afar, the rigorous hours, the strong determination. I know these educated men and women know the issues and are courageous in their work. Negotiations with an American point of view has a beginning, middle and end. American version includes action based upon conclusion. That is not the perspective of every country. And no one wants the US to give directives. The United States delegation helped all the countries that were open to it, to work on the Arms Trade Treaty. They worked diligently bringing up points that don't work and held fast on issues. I feel proud to be among them. Some will argue about this Treaty not being enough. Some will argue that it does not include what it could. But a day has occurred, the first when the world agreed in a treaty on weapons. For one second, agreement has been struck by the majority. We are accountable to our ancestors and to our children. We who exist now have a responsibility to do our best to mold this world into a better place. We are here now and it is a short time. Remember that bringing up a problem is easy, but determining a solution and putting in the time and effort to manifest solutions that make all the difference is the only thing that changes our world.